Here is the Sourdough recipe I got from Clare on The Cooks Journal it made a lovely crusty loaf, but not really the sourdough taste I was looking for. I think I'll have to try the longer method of feeding the starter to get that authentic taste. 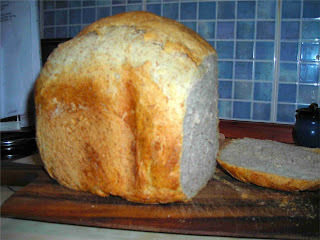 Anyway it was a lovely loaf and no trouble to make. I did the whole of the second part in the breadmaker rather than make a dough and cook it in the oven. Put this in the machine in the usual way, put on normal dough program. Leave in unopened machine for 2-8 hours after end of cycle. The longer you leave it the stronger the flavour. Put on dough program. Remove dough and knock back, make into a round and prove. Slash the top several times and bake 220C for about 40 mins. The timings work quite well if you start this at bedtime, run the second program in the morning and you have a nice loaf in time for lunch! I was unaware that you could make a sourdough bread in a breadmaker. I am glad to know though, thanks for the recipe!